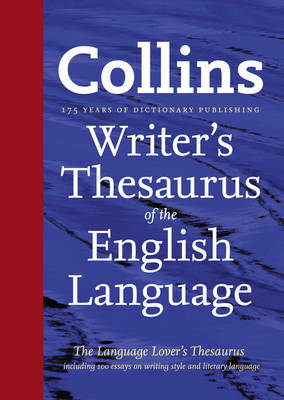 The new Collins Writer's Thesaurus of the English Language is a comprehensive thesaurus, and a browsable 'good read' for writers and language lovers. Elegantly packaged, with attractive yet durable binding, this thesaurus is an ideal guide to English for the language lover in your life. This thesaurus contains thousands of alternative words and opposites, plus a wide range of essays and special features to help with language choice and style. Expert guidance is given on language use, covering the choice of synonyms for different types of writing, and guidance on tailoring writing styles and word choice for the intended audience. Furthermore, the inclusion of over fifty fascinating themed word panels on a range of subjects from terms of affection, to gods and goddesses, to social networking, makes this thesaurus perfect for helping with games, quizzes and crosswords.